Green flashes from the Sun at sunset are a rare phenomenon, but even rarer are green flashes from a setting Moon. 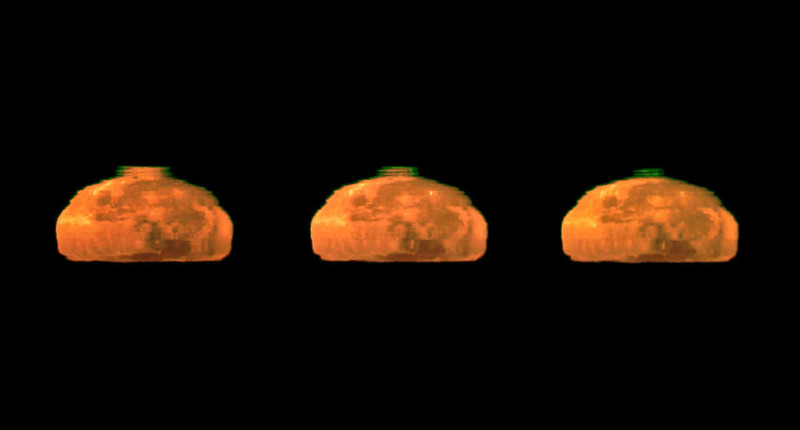 With the unique atmospheric conditions at Cerro Paranal in Chile, a photographer from ESO’s Very Large Telescope managed to what are likely the best images ever taken of the Moon’s green flash. ESO Photo Ambassador Gerhard Hüdepohl took a series of images of the setting full Moon crossing the horizon, taken on a clear early morning from the Paranal Residencia. What happens that makes the green flashes appear? The Earth’s atmosphere bends, or refracts, light, like a giant prism. The effect is greater in the lower denser layers of the atmosphere, so rays of light from the Sun or Moon are curved slightly downwards. Shorter wavelengths of light are bent more than longer wavelengths, so that the green light from the Sun or Moon appears to be coming from a slightly higher position than the orange and red light, from the point of view of an observer. When the conditions are just right, with an additional mirage effect due to the temperature gradient in the atmosphere, the elusive green flash is briefly visible at the upper edge of the solar or lunar disc when it is close to the horizon. Hüdepohl works as an Electronics Engineer at ESO’s Very Large Telescope. He said he was surprised and delighted to catch the stunning green flash from the Moon. You can read an article we did about green flashes from the setting Sun here. I knew it! This is conclusive evidence that the moon is indeed made of green cheese after all. Great pics, but I beg to differ that green flashes from are rare at sunset. I go out to photograph sunsets on a regular basis and I get green flash pics about 80% of the time…I hardly call that rare! And for the record, I live in Tucson, far away from any body of water. I saw these pics and now my goal is to get a pic of a green flash from the Moon. I did my first attempt in April and didn’t get it. I may have to drive to get a better eastern horizon…I am too close to the mountains (the mountains to the west where I get sunset pics are much farther away). Love the pictures. I do hate to be the semantics police but the title really should indicate ‘of the moon’ rather than from the moon. The intersection would be “critical about living”. Thanks, Jon. I have corresponded with Andrew Young several times about green flashes. I know about elevated horizon flashes…most of my pics from Tucson are of this variety! I have even photographed (but not seen visually) blue and violet flashes with an elevated horizon. One particularly interesting photo captures a sunset behind a sloping mountain which shows an elevated horizon green flash, blue flash and purple flash. I have even captured a cloud top green flash and blue flash (on the same night in a burst of photos) which are similar to the elevated horizon flashes. The reason I am concerned about getting a green flash from the Moon due to the mountains is that my horizon is elevated about 8 degrees to the east, not a degree or two as he says. I will give it a try, but that might be pushing it a bit! Hey Rob, let us know if you have any luck!